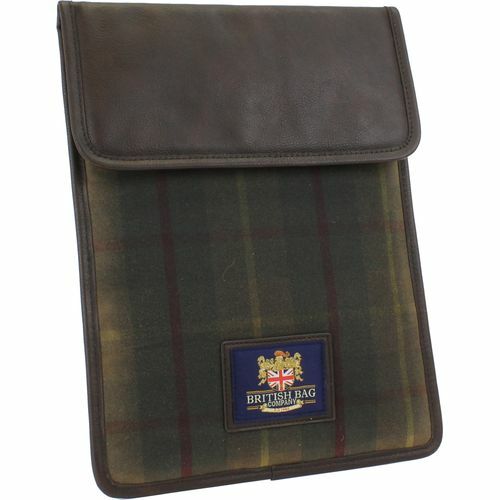 The British bag Compaby - Millerain iPad cover combining perfectly luxury with protection. This has to be the most stylish way to carry your iPad or any device with the similar dimensions. Velcro fasting for the flap, and the British Bag Company genuine label mounted onto a pu leather border sewn onto front of case the perfect unisex gift. The British Millerain Collection: - With its practical waxed cotton fabric, ideal for outdoor use, the British Millerain Collection will see you through all seasons. Available in both green/red check and plain navy, with the addition of the British Bag woven label gives this range that English Heritage Look.